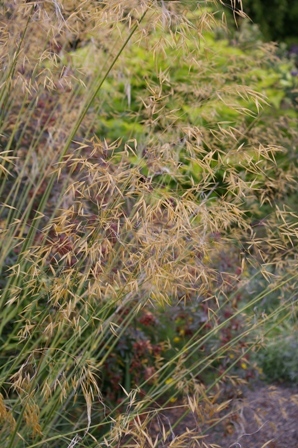 Joy Creek Photo Archive (c) all rights reserved The elegant tall bloom spikes of Stipa gigantea are held very high above the foliage. The effect of the sun on the golden flowers is dazzling. Blooms June to August. A Great Plant Picks selection.